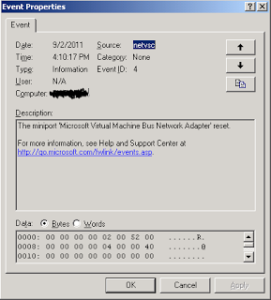 The miniport ‘Microsoft Virtual Machine Bus Network Adapter’ reset. 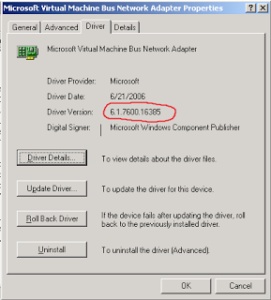 Once this happens, it’s as if the network cable was disconnected from the Server 2003 Virtual Machine. Obviously this causes a complete network shutdown for anyone using this server. NOTE: This is not a patch that should be auto-installed. 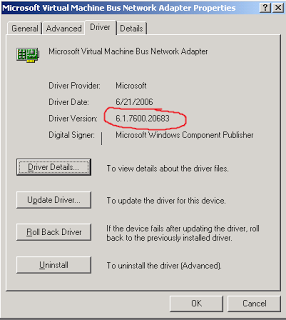 Only install this patch if a server is experiencing these exact symptoms explained in the KB article. As of writing this blog, Microsoft requires you to ‘request’ the hotfix, its not auto-downloadable.